Murdoch University had the opportunity to visit the Faculty of Social and Political Science. This visitation seek for potential cooperation that has the possibility to be initiated. 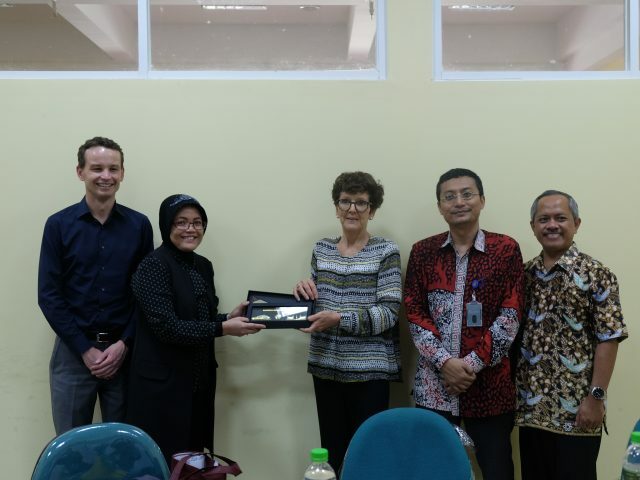 Yogyakarta, 6 February 2018, Jeffry Wilson, Celia Cornwell and Ian Wilson as the representatives of Murdoch University visited Faculty of Social and Political Science, Universitas Muhammadiyah Yogyakarta (UMY). They were warmly welcomed by Titin Purwaningsih as the Dean of Faculty of Social and Political Science companied by Aswad Ishak as the Vice Dean, Bambang W. N. as the Director of IPIREL, as well as the head of Cooperation and International Affairs Eko Priyo Purnomo, M.Res., Ph.D. Opened by the speech from the Dean, the discussion continued with the introduction from both Universities. In term of discussion, both of the Universities were given a chance to deliver their thoughts accordance with the cooperation that could be composed in the future. As well as sharing the ideas in term of Student Mobility program and strengthening the cooperation.